From a classic public relations perspective, the seemingly unstoppable oil flow spill in the Gulf of Mexico will cause damage to the reputation of energy giant BP for an undetermined about of time. The explosion on the Transocean Deepwater Horizon rig that caused the environmental, economic and political calamity of the first order happened on April 20. The April accident resulted in an “immediate crisis,” or one that happens without any warning. Now more than a month later, BP has on its hands a “sustained crisis” — one with no immediate end in sight. On this glorious Sunday in Chicago, I reviewed a full-page BP ad in the Chicago Tribune entitled: “Gulf of Mexico Oil Spill Response. What we’re doing. How to get more information.” Kudos to BP for stating, “BP has taken full responsibility for dealing with the spill,” and for providing straightforward information on efforts underway to stop the flow. There’s no question it’s BP’s problem and the company should accept responsibility. The ad offers more information through special websites, like this one from BP and another site from the overall response team, and phone numbers to call to report environmental problems or make claims. As a message, the ad is expertly crafted. The copy is direct — this is a catastrophe that’s unprecedented, and we’re doing all that’s possible — and free of jargon. From a design perspective, it’s all business: just a headline, subheads and two rows of copy. The only graphic is the BP logo at top right. The BP website — at least on the surface — does an equally effective job of communicating the company’s efforts to contain this oil spill; and, please, there’s no pun intended regarding this offshore environmental disaster. This site is clean and easy to navigate. It features some dramatic images, including this one on the home page. 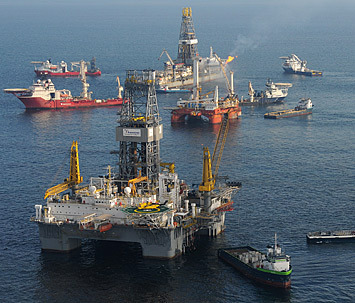 Image on BP Gulf of Mexico Response Page, May 23, 2010. Scroll down, and visitors can read news announcements posted from May 5 through May 21. And, BP BP Chief Executive Tony Hayward provides a somewhat convincing video message shot from a port in Louisiana. Here’s where I have some concerns about how BP’s public relations team is handling this crisis. Surely BP had a crisis plan in place to address a disaster like this one — an offshore rig it leased causing an uncontrolled oil spill — or another of this magnitude. Why was the first news announcement post dated May 5 and not April 22? I would imaging they could have set up a dedicated web site withing a day or two of the April 20 accident. Why did BP post just 15 news announcements, 10 with the unimaginative headline, “Update on Gulf of Mexico Oil Response” along with the publication date. In today’s never-ending media environment, it’s hard to imaging that BP could not provide more up-to-date information and transparency. Hayword’s video message was shot May 13 — 10 days ago. He’s the face of BP; he’s the guy in the trenches on site. Shouldn’t Hayword offer more frequent responses? I think so. Given its resources, why is it taking BP so long to share this relevant data?